My puppy hates her collar. What should I do? Does your puppy hate his collar? If you just brought your puppy home or only had him for a few days I’m guessing your answer is a resounding YES!!! Of course make sure you have it sized properly, but besides that you need to just sit back and let your puppy get used to his new collar. It’s that easy, but you didn’t think that’s all I had to say about this matter did you…you’re correct! QUICK TIP: We start our 8 week old puppies out with a basic nylon buckle collar. See the pic of Dublin below. My Puppy Hates His Collar! 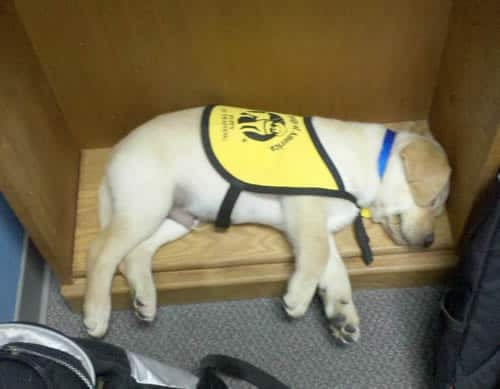 I’ve been raising guide and service dog puppies for over 12 years now and every puppy I’ve ever brought home absolutely hated his collar and none more than my second guide dog puppy in training, Derby. He didn’t just hate his collar, but he had a vengeance against his pet tags. Here are a few things I learned about puppy collars and pet tags after raising Derby. UPDATE: I’ve now raised several Golden Retriever litters, a German Shepherd mix litter, and a Chihuahua mix litter and one of the things we do very early on is start training our puppies to get used to their collars. By the time our puppies go home with their puppy raisers they have no problems wearing a collar. Unfortunately, not all litters have the advantage of being raised and trained to wear a collar. I actually learned this one before Derby. Just leave the collar on your puppy and he’ll get used to it within a few days/weeks. Get a puppy collar with a buckle system. The buckle makes it easy to remove the collar when needed. Make sure the collar fits properly. I usually make sure I can fit a couple fingers under the collar while it’s on my pups neck. You want it tight enough so it does not slip over your pups head, but as mentioned you want it loose enough to fit a couple fingers underneath while it’s on your pups neck. Certain materials may stretch or loosen while your puppy is wearing the collar (plus your puppy will grow) so make sure you check to make sure the collar has not become to loose or tight over time. Have fun with your collars! We have some seasonal collars, different designs, and materials. Have fun! Just make sure whatever you get is safe for you puppy. Some puppies don’t collars nor the jingle of the pet tag. Guide Dogs of America issues us school tags, but I also recommend getting a personal tag so if your puppy gets lost people can contact you. Make sure you register your puppy. You’ll receive another tag for registration. Even if you have tags you should microchip your puppy. Collars/pet tags can fall off and if you’re puppy gets lost people will have no way of knowing how to find you. Are you tired of the jingling of your puppies tag? Try the Pet Tag Silencer. I got a couple from our guide dog group and love them. Is your puppy chewing on his tags? Derby taught me this one. While the pet tag silencer did stop the jingling of pet tags it did not deter Derby from chewing on his tags. What did I do? Simple really, I taped his pet tags to his collar with a little bit of cloth tape. No more jingling and no more chewed up tags. A very inexpensive solution to what was at the time a big problem. Have fun with your pet tags! There are different designs and materials. I also like to get tags for certain accomplishments. For instance, I bought the Canine Good Citizen (CGC) pet tag for Stetson when he past his CGC test. In no time your puppy will be used to wearing his brand new puppy collar and his shiny new pet tags just leave them on and they’ll get used to it. By the way, this probably doesn’t apply to most people, but most of my puppies hate wearing their “Puppy In Training” bib/jacket a couple of my pups even chewed up the sides of the material. I try to get my pups used to the service dog jacket by making them wear it quite often at home even before going out in public. Nowadays I keep a close eye on my pup to make sure he doesn’t chew on the material when wearing his jacket. First things first. Make sure your puppy is comfortable wearing his collar (and service dog jacket). Once he’s used to wearing his collar your might start introducing him to other products he might need to wear during training like a leash and harness. QUICK TIP: As mentioned earlier if you don’t like the jingling of pet tags then you can DIY it and tape them together or get a fancy pet tag silencer like the Thundercover from the same folks who brought you the Thundershirt (a tool we use for our dog’s when they have anxiety). 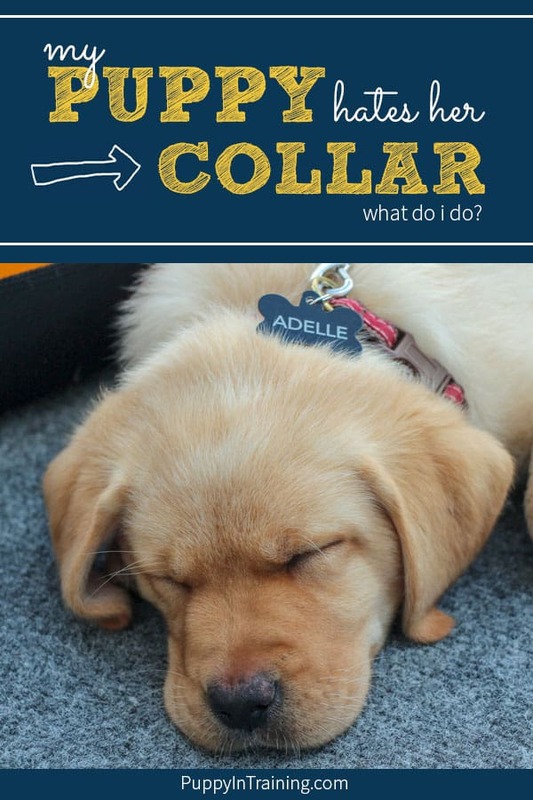 Do you have any tips for puppy’s who hate their collars and pet tags? Tell us about your experiences with puppy collars and pet tags. Does your puppy hate her collar? UPDATE: This post was originally published March 6th, 2012. We made some updates and left some of the content the same. We’ve learned a lot over the years and it reflects in the new information. My 6 month old labradoodle bites his leash. Every time I take him out he starts biting it. He’s chewed through 2 leashes which broke the first time he took off after a rabbit, cat, squirrel, bird. I’ve tried spraying the sour apple spray on it, but I’m pretty sure that’s his favorite flavor. Lol. Please help. He cannot go outside without a leash. We live too close to a busy street. Knock on wood, I haven’t had a puppy that hated their collar. They have scratched at it for the first day or so, but nothing major. These tips will come in handy though if we do get a puppy that hates their collar. It can be frustrating if your puppy hates his collar. Derby tried over and over again to chew his collar. He mostly got a hold of his tags and pretty much destroyed his GDA tag. If your dog gets used to his collar do you think he would be used to any type of collar after that? Or would you have to go through the same “wait it out” technique each time you switch collars? Like if you started with a fabric collar and the switched to a leather one? We usually start out with the nylon buckle collar. After out puppies have gotten used to the nylon buckle collar they don’t have issues with the other collars we’ve tried. In the past we’ve also used leather and fabric collars. We also sometimes use martingales with our dogs. Raven even has a rubber collar. Have never had a pup that hated their collar…the kennel? Yes. Not the collar. I am with you on this one, though. Leave it on. They will get used to it. It is a necessity. They can’t go without one. Yeah, I have my fair share of experiences with dogs who totally hate their collars. Took me some training and acclimatizing before they stop trying to take them off. My Bernese Mountain Dog doesn’t like her’s either. When we go on walks, she always is trying to bit through her collar. Always! In the end, I think it gets better overtime as the dog gets used to it (as long as their fitting properly).